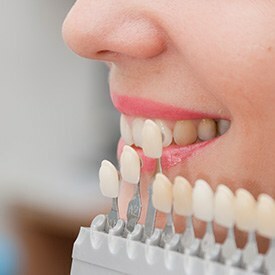 Veneers are thin sheaths of dental grade porcelain. They are affixed to the front surfaces of teeth to completely reshape the appearance of the smile. Any number of chips, cracks, stains, and gaps can be corrected with this one effective cosmetic dentistry procedure. Using the highest quality materials, the La Plata Dental team can create your dream smile with porcelain veneers. If you’d like to find out more about the porcelain veneer process, contact our dedicated dentist and team to schedule your cosmetic dentistry consultation today. 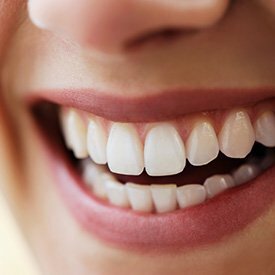 We’ll carefully examine your smile, and if we determine porcelain veneers are a good option for you, we can begin the smile design process. The entire porcelain veneers process is completed in three appointments: planning and design, preparation, and placement. During the initial appointment, we’ll use diagnostic x-rays and images to design your custom veneer. We can use photos of your favorite celebrities as a guide point for what you look for in an ideal smile, so please don’t hesitate to bring these along. We’ll take the necessary time to answer questions and ensure we’re creating your desired smile. In many cases, we’re able to complete the design part of treatment on the same day as the cosmetic dentistry consultation. During the second appointment, the treatment area is numbed using local anesthetic. Then, we prepare the teeth and capture impressions of the bite. All of this information will be provided to our trusted dental lab where your flawless, custom veneer will be crafted. Before you leave our office, we place a temporary veneer. This temporary protects your teeth and allows you to get used to the look and feel of veneers. Once we receive the final porcelain veneer from the dental lab, you’ll come back in for the third and final stage of treatment. This last visit will likely be the shortest. We’ll remove the temporaries and exchange them for your quality, custom porcelain veneers. Once your porcelain veneers are in place, these durable cosmetic solutions will maintain their flawless appearance for years. Unlike natural tooth enamel and other restoration materials like composites, porcelain is naturally stain resistant, so you maintain your gorgeous results for years. You should continue daily brushing and flossing and visit our team twice a year as usual.